Pardon the interruption | Whiteboard "Comics"
Well, here we are again. I think I’m going to keep these cats around for a couple of days. They should talk about lame stuff more. Also, I don’t care what Chuck Klosterman says. We may agree on a lot, but Chinese Democracy is absolute rubbish. 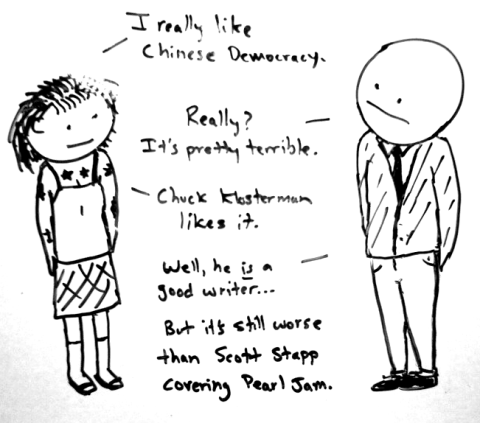 Earlier, I mistakenly linked to this version of Chuck Klosterman’s review of Chinese Democracy. It’s actually an April Fool’s Day joke. From April. The man behind this mistake has been sacked. Give the Chinese time. Put yourself in their shoes and objectively look at what goes on in the US. They are probably very, very cautious…but you can’t deny they’ve come a long way in the past even 10 years. They’ll find their own balance, on their own terms. But I think they’ll find it nonetheless… patience grasshopper, patience. i thought we were talking about rock n roll, what’s all this stuff about China?